When we think of these events, they mostly involve a smaller or a larger group of people gathered in the building. No matter the nature of the activity, the people involved will most likely spend more than an hour in church. A good church will have the best church chairs for the visitors – for comfort and quality. Church auditorium seating is of great importance for the visitor of the service as well as for the wedding guests and choir singers. These chairs for church auditorium must meet the requirements of style, function and frequent use. A light, illuminated and inviting church building is complete with a suitable choice of furniture. It is becoming more and more popular to choose warm-toned hues, wooden detailing, simple structures and flowing shapes in the church interior. The inspiration comes from the modern Nordic churches, for example, the famous Tromso arctic cathedral. Modern church chairs must support this interior and Plycollection offers multiple solutions. Church seating chairs are probably the most important functional part of church furniture ensemble. The company among others produces chairs for church halls and chairs for church auditoriums. Wooden church chairs work really well with different interior styles due to the variety of finishes, lightweight look and flowing design. The wood quality also allows a range of different varnish tones to match the design of the specific church. 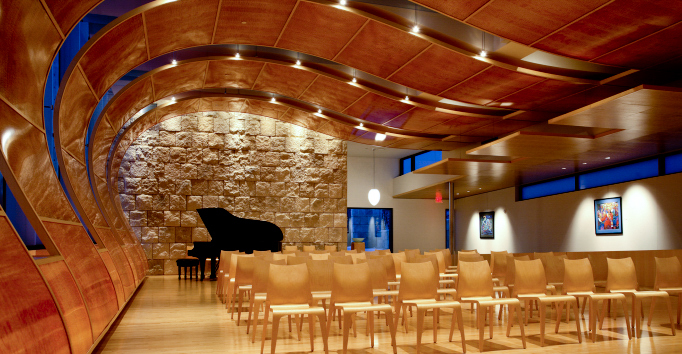 Usually, the auditorium of a church is designed to hold a great amount of light, even playful light angles hitting the room from strategically placed windows. This type of room calls for furniture that compliments the light and has natural shapes. Be it chapel chairs or church auditorium chairs – Plycollection is able to produce the right shade and shape of church chairs for the best churchgoer experience. Stacking chairs for churches are the contemporary solution that is both safe, environment-friendly and comfortable for the regular church visitors and guests at weddings, baptisms etc. The same chairs can be used and easily moved from the auditorium and be used as church choir chairs or hall chairs. Padded stackable church chairs – why not? Comfort and practicality allow the same set of chairs to be used in different situations. Plycollection is open to client ideas and requirements as well as originality. Birch church chairs, oak church chairs or wenge church chairs – it all depends on how much colour and personality the church would like to show. Designer furniture is not limited to office buildings or homes, it is meant to be used wherever comfort and quality are needed, and a perfect place for that is a church.